By island hopping you'll notice how different the islands are, despite being so close to each other, but one thing they do have in common are the exuberant, fun-loving, and easygoing Filipinos, and you'll no doubt sing a song or two with them along the way! We meet in Cebu to take advantage of the international airport, but the next day, we are off to Bohol by boat. We ride directly from the dock to explore this unique island home to the big-eyed tarsiers, terraced ride fields, and languid rivers. We head to the more remote resort town of Anda and then explore the white sands of Alona Beach on the southern tip of Panglao Island. Our next destination is Siquijor Island, known for its mystic healers who live in the highlands. We next make our way back to Cebu with a brief ride on the island of Negros on the way there. We ride up the coast of Cebu before crossing the hilly core to the east coast and transferring to Cebu City. After airport transfer and check-in, we have a trip meeting and dinner. A morning boat ride takes us to Bohol. We ride on a quiet dirt road to the Tarsier Sanctuary for a visit. Then we are back on the bikes and on to the picturesque Loboc River. We start the day with an uphill climb before the terrain evens out, until the end of the day, when there is yet one more uphill to our hotel. We ride through a mahogany forest, visit a butterfly garden, and the world-famous Chocolate Hills. A tough start to the day with a 6-km climb, followed by a great downhill of 20 km! We then cycle on a coastal road to our beachside resort in Anda. Rest or explore the beautiful beaches of Anda. Or visit Lamanok Island with its incredible cave paintings. We cycle through rural Bohol, and after 50 km, we transfer to Bilar. Back on the bikes, we cycle to Inambacan Falls where we can have a dip in the crystal clear pools. Another day of great coastal riding. We stop at one of the oldest stone churches in the Philippines and end the day at yet another stunning beach, this one with white sands. We ferry to Siquijor and ride to take a dip at the refreshing Cambugahay Waterfalls. We cycle the coastal road around Siquijor, stopping along the way at St. Isidore Convent, known as the biggest convent in Asia. 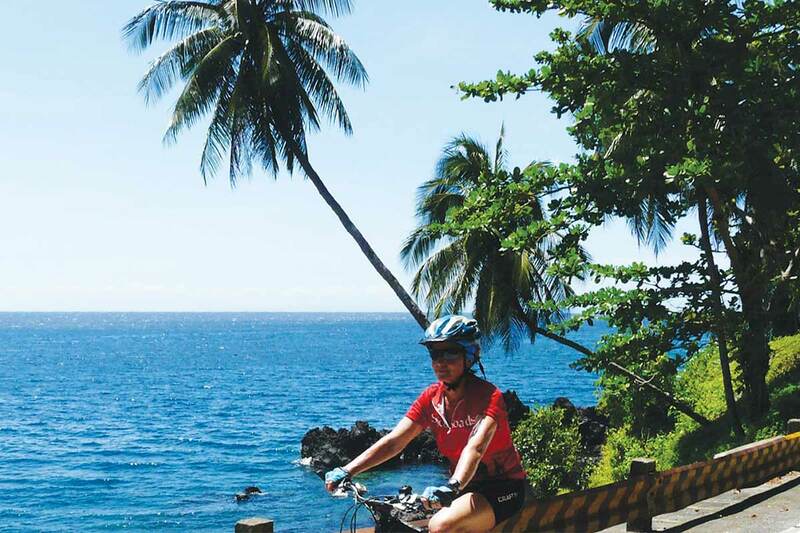 Cycle Siquijor's “Highlands” to visit the heart of this mysterious island. Some serious climbs await but once we reach Mount Bandilaan National Park, we have a spectacular downhill. After a short undulating ride, we ferry to Dumaguete on Negros Island and cycle around 11 km. 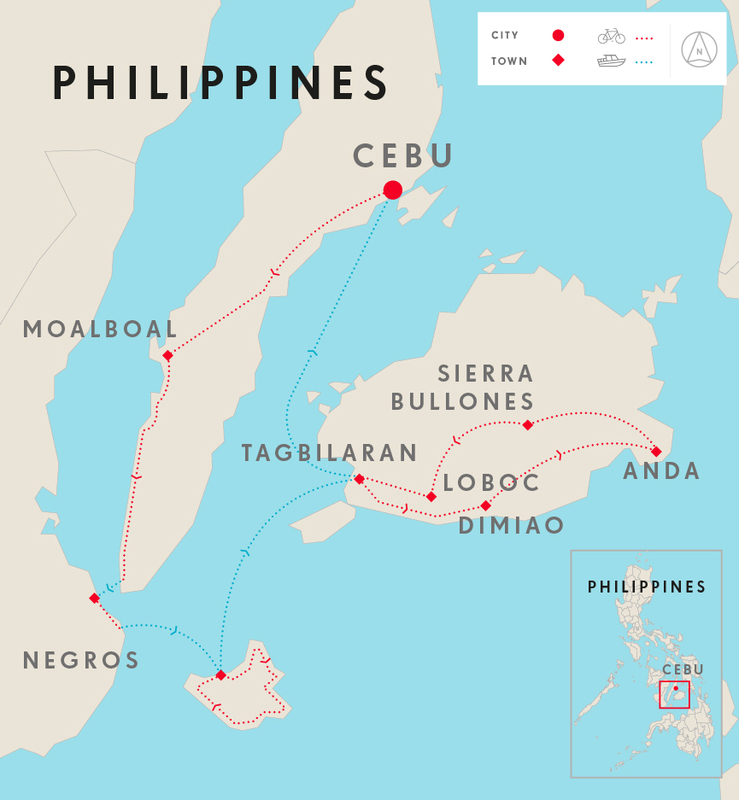 Then we take another short ferry ride across the Tañon Strait, known for whale and dolphin watching, to Cebu, and bike along the coast to Moalboal. We cross to CarCar City, where we hop into our support vehicle back to our hotel in Cebu for our farewell dinner. Airport transfers or extended stays. Day 2 - Cebu City - Loboc Ride 39km. +403m / -399m. Wonderful hotels, fascinating country, delicious food, warm people. This tour was very well planned and managed. The resorts and hotels were all excellent and very romantic and peaceful. The cycling was no problem but of course the heat and sun made some of the days strenuous. I personally prefer shorter tours and there is a 'rest day' and a 'ride around an Island' which could easily be missed out if the tour is shortened. I understand that most people travel a long way to join the tours and need more time to make the journey worthwhile. All things considered, I rate this tour highly and would recommend it to other SpiceRoads cyclists. The Philippine Islands visited are very beautiful and the local life very picturesque. We ride 598 km, about 90% on road, in 9 cycling days. We designed the route to see a wide variety of islands as well as seeing the best sites on each of them. We cycle many different paths, from undulating roads to short steep climbs to awesome descents, and, of course, flat coastal roads. Your guide’s expert knowledge of the area and terrain means that you always know what is coming up in terms of distance and difficulty. Suitability: There are a few hilly sections, so cyclists should be in relatively good physical shape overall with, at minimum, a moderate degree of cycling experience. The daily distances aren't overly long, but you can expect to be riding for at least 4 hours a day. Being physically fit will, of course, be a huge asset, but as the tour is fully supported, the van is always close at hand if needed. Biking Conditions: Your Philippines biking experience is primarily on tarmac with very little traffic. There are a few sections of dirt roads, but there is no technical riding on this tour. There are a few challenging climbs, as well as some fast, sweeping descents. Any portion of the ride can be skipped by utilising our support vehicle. We'll pick you up in Cebu at Mactan International Airport and bring you to the hotel. In the evening, we will have a trip meeting and dinner. Early morning, a boat brings us to Tagbilaran, the capital of Bohol. After lunch, we ride a quiet dirt road through small villages, past a small lake, and terraced rice paddies. It brings us up to a paved road where we quickly find ourselves at the Tarsier Sanctuary. After learning about these unique nocturnal creatures and hopefully sighting one or two, we are back on the bikes for a fabulous winding ride down to the picturesque Loboc River and our resort. This morning, we start early as we have a hill to conquer. We pass a mahogany forest, enjoying two km of shade under the tall trees before we ride through rice fields and small villages. We take a break and visit a butterfly garden. We continue to the world-famous Chocolate Hills. A short but steep climb takes us to the top of a hill where we park the bikes and take in the scenes created by these unique formations. After lunch, we continue riding on to Sierra Bullones and bike uphill through scenic rice terraces still worked by water buffaloes to our hotel with three swimming pools. We have a tough start with a 6-km climb, but it's through scenic terraced rice fields, so stop for photos and take a breather! When we reach the top, we have a great downhill of 20 km. Breath-taking views are guaranteed as we whiz by villages on our way to the coastal town of Jagna. We then follow the coast to the provincial town of Anda and our beachside resort. Today is yours to rest or to explore the beautiful beaches of Anda. One option would be to visit Lamanok Island and the anthropologically important cave paintings – made with bare hands – that date back tens of thousands of years. You can also see fossilised giant clams on the island. Other options are to snorkel the coral reefs off the beach or to just relax by the pool. We cycle through rural Bohol, seeing rice fields to our left and right as we cycle through the town of Alicia, named after the wife of former president Elpidio Quirino. After 50 km, we get into the vehicle and transfer one hour to the town of Bilar. Back on the bikes, we cycle to Inambacan Falls where we can have a dip in the crystal-clear pools. We end with a 6-km cruise down to our beachside resort. Another day of great coastal riding. In Loay, we visit an ancestral house and try "corn" coffee and "tablea" chocolate harvested in the Philippines. We stop in Baclayon and visit the stone church, considered one of the oldest in the Philippines. We then continue riding to Panglao Island, where we have lunch at an organic bee farm. After that, we end the day at yet another stunning beach, this one is known for its white sands. We transfer to Tagbilaran, where we take the morning ferry to Siquijor. The island has a reputation as a place of magic and sorcery; it is now more famous for its healers that perform rituals where incantations are sung and where potions of herbs, roots, insects, and tree barks are concocted. From the ferry, we cycle 15 km to our hotel. Then the choice is yours to relax at the beach or to continue cycling another 18 km to Cambugahay Falls, a cascading multi-tiered waterfall, with fresh and clean water coming from natural springs forming many beautiful natural lagoons. After a refreshing dip, we head back to our beach resort. We circumnavigate the mystical island on its coastal road. We stop along the way and visit Cang-Isok House, which dates back to the mid-1800s and is the oldest house in Siquijor, St. Isidore Convent, known as the biggest convent in Asia, and Capilay Spring Park, a natural spring. On our ride, we'll meet lots of locals working on their fishing nets or boats, reminding us how important the sea is to island life. We'll cycle Siquijor's “Highlands”, but be prepared for serious climbs as we visit the heart of this mysterious island. We will try and visit with a local healer. Once we reach Mount Bandilaan National Park, we have a spectacular downhill waiting for us. As we near the coast, we'll take a break at the refreshing Cambugahay Waterfalls for a dip. We then can ride or take transport back to the resort, depending on how the legs feel after all those climbs! There's also the option to visit nearby Apo island, a marine sanctuary, for diving or snorkelling. Today, we'll be on three islands and two boats! After breakfast, we'll have a short ride to the pier where we take a ferry to Dumaguete on Negros Island. We then cycle around 11 km before we take another short ferry ride across the Tañon Strait, which is known for whale and dolphin watching. Hopefully, we'll get lucky and spot some during our crossing. Once we land on Cebu, an amazing coastal ride brings us all the way to Moalboal. We cross narrow but hilly Cebu Island to Carcar City. In Carcar, we hop into our support vehicle that brings us back to our hotel in Cebu. In the evening, we visit TOPS, the famous viewpoint with amazing city views. It's time then for our farewell dinner where we can reminisce about all we have seen and done on the tour. Time to say goodbye to Cebu. We can drop you at Mactan International Airport. Because some people can't imagine going on a trip without their own beloved bicycle, we do not provide them as part of this tour. However, you can hire bikes locally for the price listed in the tour pricing section. The bikes are well-known makes of mountain bikes with lightweight alloy frames, 24- to 27-speed gearing, disc brakes, and Shimano components and front suspension. If you bring your own bike, please make sure it is a mountain bike with front suspension and in good mechanical order. All nationalities require a passport for entry into the Philippines. Please ensure your passport is valid for at least 6 months from date of entry. If staying less than 30 days then a visa is not required by European, North American, Australian and many other nationalities. The exceptions being passport holders of Hong Kong Special Administrative Region (SAR), British National Overseas (BNO) and Macao Special Administrative Region (SAR) who are only allowed up to 7 days stay without a visa. You will need to show proof of an onward flight out of the Philippines. For stays longer than 30 days, a Temporary Visitors Visa is required. Climate in the Philippines is hot, humid, and tropical. The average yearly temperature ranges from 25°C/ 78°F to 32°C/90°F. Filipinos generally recognize three seasons: Summer from March to May (the hottest); Rainy Season from July to November (the wettest and also typhoon season) and Cold Season from December to February (moderate for those from temperate countries). Meals are included as per the itinerary where B=breakfast, L=lunch, D=dinner. Most meals are local and feature noodles, rice, curries and soups. Any special dietary requirements can also be catered for as well. Please let us know at the time of booking. We recommend that you tuck away a few extra dollars, perhaps US$20, for incidentals per day. We recommend that you tuck away aThe currency in the Philippines is the peso (P), which is also spelled piso in Filipino. ATMs, which are abundant, are the easiest way to get pesos. For getting cash, Cirrus and Plus are the most widely accepted; for cash advances, MasterCard is the most widely accepted, followed by Visa. Banks offer the best foreign-exchange rates. Credit cards are accepted in big cities and resort hotels but you’ll need pesos for family-run guest houses or restaurants.